(Cerasus), a genus of woody plants of the family Rosaceae. The leaves are alternate; the flowers are white or rose, gathered in small inflorescences or umbels. The fruit is a juicy stone fruit with a spherical stone (endocarp) that holds one seed. There are 150 known species, 21 in the USSR. The most widely distributed are the sour cherry (the ancestor of most of the varieties), ground cherry, sand cherry, and Nan-king cherry. The genus Cerasus also includes the gean. In the USSR the cherry tree is the most widely distributed fruit tree, second only to the apple tree. (Cherry trees ac-count for approximately 27 percent of the area occupied by all fruit tree plantings.) The plants are valued for the good food qualities of the fruit, winter hardiness, early fruit-bearing maturity (in the third or fourth year after planting), and annual high yield (up to 10 tons per hectare). The fruits from cherry trees contain 7.3 to 17.5 percent carbohydrates, 0.8 to 2.4 percent acids, and 0.15 to 0.88 percent tanning substances. They are used both fresh and processed, in the form of preserves, jam, wine, brandy, compotes, and pastry goods. Cherries are cultivated in many countries of the northern hemisphere. In the USSR they are grown mainly in the Ukraine, Moldavia, the Northern Caucasus, the central regions of the RSFSR, the Volga Region, and Byelorussia. The sour cherry (C. vulgaris) is not found wild but has been cultivated since ancient times. It is supposed that this species originated from the arbitrary crossbreeding of the gean and the ground cherry. There are two groups of cultivated sour cherries—shrubs and trees. The shrub types are small trees with spherical crown and drooping branches; they mature earlier and are more frost-resistant than the tree forms. As a rule, the fruit is dark in color, almost black. (Cherry trees with such fruit are called Morello or Marasca sour cherries.) Shrub cherries bear fruit mainly on the growth from the previous year (on long annual shoots). Tree cherries have a mixed fruit-bearing character, bearing fruit mainly on clusters of twigs and to a lesser extent on shoots. Shrub cherries include the widely distributed varieties Vladimir and Liubskaia; tree cherries include Kent, Sklianka, Amarelle rose, Anadol, and others, mainly from the amarelle group (varieties with colorless juice). The sour cherry is more drought-resistant than other fruit varieties (for instance, apple, pear, or plum). The ground cherry (C.fruticosa) is a low shrub 0.5 to 1.5 m high which forms abundant root shoots. It grows in the wild state in Central and Southern Europe and, in the USSR, in the Volga Region, the Northern Caucasus, the Urals (up to 56° N lat. ), and Western Siberia. Ground cherry plants growing in northern regions are characterized by great frost resistance, drought resistance, and early maturity. The cross-breeding of sour cherry and ground cherry by I. V. Michurin and other breeders has resulted in several winter-hardy and high-yield varieties. The sand cherry (C. pumila) is a shrub up to 1.5 m high, with leathery, shiny, elliptical leaves, small white sessile flowers, and dark-colored fruits weighing up to 3.5 g and having green and red flesh. It grows wild in the central states of the USA in two forms: the western sand cherry (C. pumila var. besseyi) and the eastern sand cherry (C. pumila). It is valued for its winter hardiness and its high yield. In the USSR it is cultivated in the Urals and in Siberia and is used in breeding. 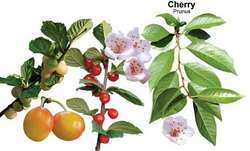 It crossbreeds well with the eastern and American species of plum, apricot, wild myrobalan, and Nanking cherry. The cultivated forms which are hybrids with plum include Opata and Sapa in the USA and Desertnaia dal’nevostochnaia, Novinka, and Iuta in the USSR. Nanking or Manchu cherry (C. tomentosa) is a small shrub 1 to 2.5 m tall with numerous thin branches covered with gray feltlike fuzz. It is frost-resistant, has a high yield, and bears fruit early. It grows wild in Central Asia and is cultivated in the USSR (Far East), China, and Japan. The mahaleb cherry (C. mahaleb), a shrub or tree, is 10 to 13 m high with a crown thickly covered with leaves. It is encountered in shrub thickets on open, rocky slopes in the western and southern parts of the Ukraine, Moldavia, Middle Asia, and the Caucasus. It is used as stock for cherry trees and geans. Ornamental forms of cherry are also raised; they have double flowers of white, rose, red, and other colors. Some of these ornamental species are C. sachalinensis, a tree up to 15 m tall; C. serrulata, a tree up to 7 m tall; C. maximowiczii, a tree 6 to 7 m tall; C. glandulosa, a shrub up to 1.5 m tall; C. humilis, a shrub 0.5 to 1.5 m tall; and C. campanulata, a shrub with dark-violet flowers. Approximately 100 varieties of cherry are grown in the USSR. Cherry trees are propagated by seeds (stones), root shoots, and stock grafting. The seed method of propagation is used in selection for new varieties. Many local varieties are propa-gated by root shoots; these include Vladimir, Rastun’ia, and Shubinka. Grafted trees bear fruit earlier than those grown from offshoots, but the latter are longer-lived. The best places for planting cherry trees are the southern slopes in northern and northwestern regions and the western and southwestern slopes in regions of the central belt of the USSR. The best soils for growing cherry trees are loamy and rich in nutrients. Before planting, the soil is worked deeply and fertilized (40-60 tons of manure per hectare, up to 90-120 kg of active substances of phosphorus and potassium, and, for podzol soils, 2 to 6 tons of lime per hectare). Hardy varieties of cherry are planted with a distance of 6 m between rows and 4 to 5 m between plants within the row; medium hardy plants require 5 m between rows and 3-4 m between plants; and nonhardy plants, 4 m between rows and 2-4 m between plants. In regions of the central and northern bands of the USSR, planting is done in the spring. Self-sterile varieties are planted together with pollinator varieties. The crown is formed by the layer-cut system with a small trunk. Each year the weak branches within the crown and those which have stopped growing are removed. The soil between rows is kept under autumn fallow with a summer sowing of green manure crops. Right after planting and at two- to three-year intervals, up to 30 tons of manure per hectare is applied, and there are yearly applications of mineral fertilizers. Pests include the pear slug sawfly, plum sawfly, cherry weevil, cherry shoot moth, cherry fruit fly, and cherry blackfly; among cherry diseases are brown rot fungus, clasterosporiosis, coccomycosis of stone fruit crops, cytosporosis, and verticilliosis. Ven’iaminov, A. N. Vishnia i sliva. Moscow, 1955. Teterev, F. K. Vishnia i chereshnia. Leningrad, 1958. What does it mean when you dream about a cherry? Any trees or shrub of the genus Prunus in the order Rosales. The simple, fleshy, edible drupe or stone fruit of the plant. An even-textured, moderately high-density wood of the eastern US, rich red-brown in color; takes a high luster; used for cabinetwork and paneling. And the cherry trees bowed down, bowed low to the ground, And Mary gathered cherries while Joseph stood round. 4 million, to send pictures of their cherry pie delicacies. Tom Sanders, 19, Suffolk "I prefer the Marks & Spencer cherry. What makes Cherry Prepaid more exciting is the bonus Load feature exclusive to all Cherry Prepaid subscribers. American cherry can be finished in a wide range of colors and turns more red with age. Cherry is the second crop after strawberries, which hits the market post winters. BugVibes[TM] Cherry repels Japanese beetles, cherry fruit flies, cherry worms, and birds (especially robins). There are a number of qualities that make cherry a great furniture wood. You can use this as a filling for cherry pie or poured over pancakes, cheesecake or ice cream. The Euclid cherry line is the first of its kind in Washington and features new technology for electronically sizing and sorting cherries. HAMMANA, Lebanon: Electric red cherry-based syrup brightened Khaled Hamza's table of clear herbal medicinal potions and dried teas on sale at Hammana's Cherry Day festival Sunday. Cherry Burst, aimed at children, was launched exclusively in Morrisons last year, while Cherrygood Plus, a 100 percent concentrated Montmorency cherry juice, launched in independent health food stores last summer.